SUNNYVALE, Calif., April 5, 2016—Trimble (NASDAQ: TRMB) announced today the latest version of its smart water mapping and work management software—Trimble® Unity 3.0. Trimble Unity is a cloud-based, (GIS) centric software-as-a-service (SaaS) solution for smart water management. Version 3.0 includes new features and workflows and also offers an App Builder and new integration capabilities to simplify connecting mobile workers with maps and data from back office enterprise systems. 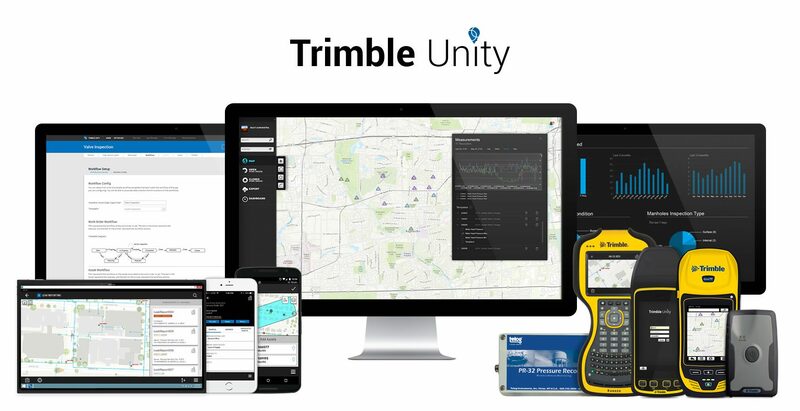 Trimble Unity offers a unified cloud-based and mobile collaboration platform for smart water mapping and work management to water, wastewater, stormwater and environmental water industry customers. The software is designed to automate a variety of workflows through individual “apps” that enable utilities to monitor real-time operations, deploy smart meters, assess the condition of assets, repair leaks to reduce non-revenue water (NRW), and locate and map critical infrastructure using Trimble high-accuracy GNSS mapping technologies. Trimble Unity can be deployed to assist utilities in reducing spills and environmental damage, extending the life of aging assets and enabling improved worker safety and productivity. These benefits enable utilities to address many of the significant challenges they are facing due to water shortages, flooding, budget constraints and environmental regulations. The new version includes a variety of apps with enhanced features for automating and streamlining common water, wastewater and stormwater asset management activities and monitoring field operations. Customers are now able to use the included App Builder to create and customize their own apps, workflows and data collection forms to improve their organization’s existing business processes. Version 3.0 adds new administration capabilities for managing mobile and office user roles, access rights and available apps. The product also includes new integration capabilities for allowing customers to connect Trimble Unity with their existing third-party back office customer service and asset management systems and provide a single GIS-centric field solution across their entire workforce. Trimble Unity leverages the Esri ArcGIS technology across the product providing support for Esri GIS mapping in the office and field. Trimble Unity is available on iPhones, iPads, and Windows and Android smartphones and tablets as well as on Trimble rugged, high-accuracy mobile mapping devices. New App Builder and Administration. Customers and partners can build custom apps, workflows and data collection forms with the new App Builder. A simple wizard-based tool walks users with admin roles through the app configuration process, allowing the configuration of GIS data, basemaps, workflows and data collection forms. Forms are built using a drag and drop form builder tool supporting various data formats and business rules. Smart Outage Tracing. Identify and locate valves that are to be shut off to isolate a water main break quickly. The feature also includes the capability to skip valves that are inaccessible or inoperable. The valves, hydrants and affected customers can also be retrieved and included in the workflow. Work Management Enhancements. Dispatch multiple work orders or jobs at once from either the work list or the map. Supervisors and dispatchers can filter and prioritize the work, then batch dispatch multiple work orders based on spatial location, scheduled date, or priority. Work Order Integration. Extend the work order in Trimble Unity to include additional information from third-party systems. The information can then be accessible by the field technicians using the mobile application when performing the work. Work order extensions can include customer information, meter read history, or any other information required to complete the work in the field and is not available in the GIS. Work Order Tracking. Track work related information including capturing labor, equipment and material usage for cost tracking. This feature can be used to configure capturing work completion codes or any list of work related information. Asset Work History. View the history of all forms collected on a particular asset in the GIS. Users using the Trimble Unity Web application can tap on any asset and quickly access the history of all forms collected on that asset. Workflow Notifications. Easily access workflow actions to quickly progress work through the configured workflow, avoiding additional clicks. Notifications are now displayed on the mobile application when new work assignments are downloaded. Mobile Offline. Mobile workers can use Trimble Unity on their Android, iOS and Windows mobile and tablet devices when disconnected from a wireless data network and synchronize automatically when a wireless connection is available. Trimble Unity Version 3.0 is available now through the Trimble Water Division and its authorized distribution partners. For additional information on Trimble Unity, visit: http://www.trimblewater.com/unity.html. Trimble’s Water Division specializes in field and office solutions for GIS mapping and work management, field data collection, design and inspection, and wireless infrastructure monitoring and management for water, wastewater and stormwater utilities, manufacturers and service providers around the world. Trimble’s solutions integrate advanced positioning, sensors and mapping technologies with software and hardware to automate utility mapping, design, construction and operations, enabling increased productivity, enhanced regulatory compliance and improved customer service and response. For more information about Trimble’s Water solutions, visit: www.TrimbleWater.com. Trimble is transforming the way the world works by delivering products and services that connect the physical and digital worlds. Core technologies in positioning, modeling, connectivity and data analytics enable customers to improve productivity, quality, safety and sustainability. From purpose built products to enterprise lifecycle solutions, Trimble software, hardware and services are transforming a broad range of industries such as agriculture, construction, geospatial, and transportation and logistics. For more information about Trimble (NASDAQ:TRMB), visit: www.trimble.com.